A fighter with the Syrian Democratic Forces stands guard on a rooftop in Raqa, northern Syria on October 20, 2017 after the city's capture from the Islamic State group. Moscow - Russia on Sunday accused the US-led coalition in Syria of having flattened Raqa with a Dresden-like bombing campaign and masking the destruction with a rush of humanitarian aid. In a statement, the defence ministry said that Raqa -- the capital of the Islamic State group's self-proclaimed caliphate -- "inherited the fate of Dresden in 1945, razed to the ground by Anglo-American bombings." US-backed Kurdish-led forces last week recaptured Raqa, the capital of IS's self-proclaimed caliphate and its last major stronghold in Syria. US officials hailed the event, led by President Donald Trump who, using another acronym for IS, said "the end of the ISIS caliphate is in sight." "The bravura statements by official representatives of the US administration about the 'outstanding victory' over IS in Raqa prompt bafflement," the Russian ministry said. The US is overplaying the strategic significance of the fall of Raqa, it charged. 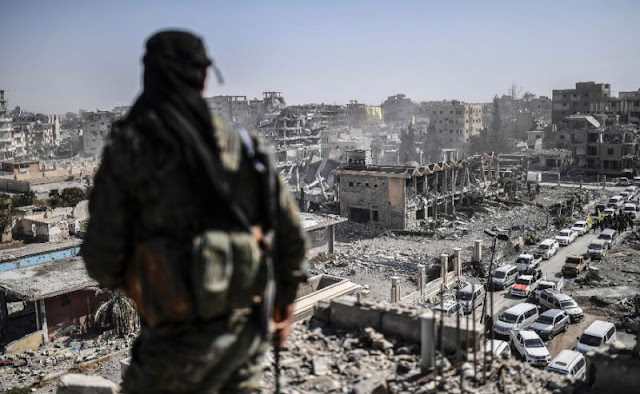 "There is only one (reason) -- the aim is to sweep away traces of barbaric bombings by US aviation and the 'coalition' that buried in Raqa's ruins thousands of peaceful citizens 'liberated' from the IS," the ministry claimed. Russia has been operating a bombing campaign in Syria since 2015, when it stepped in to support President Bashar al-Assad's rule and tipped the conflict in his favour. Human rights monitors say that the raids have resulted in many civilian casualties.